When you place a Lucky 15 bet, you are placing 15 bets on four different selections. A £1 win-only Lucky 15 bet would, therefore, cost £15. The amount won from a Lucky 15 bet depends on the number of selections which win and the odds of each one. Because a Lucky 15 bet contains single bets, only one win from the four selections is required for a return on the bet. It is highly unlikely though that should only one selection win, that the original stake is covered. The 15 bets consist of four singles, six doubles four trebles and a fourfold accumulator. The diagram below shows a win-only Lucky 15 bet and each of the bets within it. Bets one to four consist of singles. Bets five to ten consist the doubles. Bets ten to 14 consist of the trebles and the final 15th bet is the accumulator. Work out your winnings with our Lucky 15 Bet Calculator. What Are the Advantages of Making a Lucky 15 Bet? A benefit of the Lucky 15 is that it vastly diversifies the risk of one selection losing within a multiple bet. A traditional accumulator is lost when just one selection doesn’t win. If you’re more confident the majority of your selections will win, then a Lucky 15 will increase your chances of a positive return on your stake. Plus with the four single bets, an advantage is that it is a higher stake, higher reward bet. From a different perspective, the disadvantage of a lucky 15 bet is the stake required. 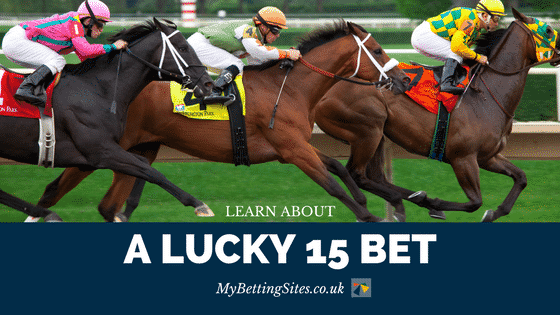 With 15 bets, the cost of placing a Lucky 15 can be very high. You need to consider the increased chance of winning is worth this higher stake. Is It Possible to Do an Each Way Lucky 15? An each way Lucky 15 bet consists of 30 bets. 15 of the bets are to win, as above in the image. 15 extra bets in an each way are for the selections to place. What Is the Difference Between a Lucky 15 and a Yankee? Yankee bets also feature four selections, but there is a key difference. A Lucky 15 has 15 bets. In contrast, a Yankee has 11. 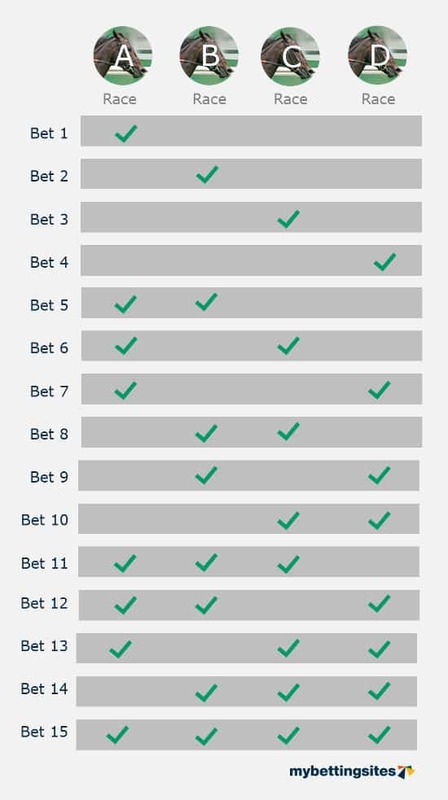 A lucky 15 bet includes all the 11 bets in the image above but features an additional four bets. These four additional bets are four singles, one for each of the selections. This will increase the size of the stake, but also increases the size of the return if all four were to win. A Lucky 15 bet consists of 15 bets over four different selections. It has four singles, six doubles, four trebles and a fourfold accumulator. Its popularity is derived from the increased chance of achieving a return versus a traditional accumulator.